Wind World (India) Ltd. helps organize project finance for Wind World (India) Ltd.'s own Independent Power Projects (IPPs), as well as for the Engineering Procurement and Construction EPC customers of Wind World (India) Ltd. We have successfully arranged project finance to the tune of Rs.2,000 crores till date. This is done through Wind World Financial Consultancy Private Limited (WWFCPL) a 100% subsidiary of Wind World (India) Ltd. (WWIL). WWFCPL has successful in arranged project financing for large size wind energy IPPs on a project recourse basis. This is done in line with financing of similar projects internationally, for tenors that are comfortably managed by such projects, often at extremely optimum interest cost. 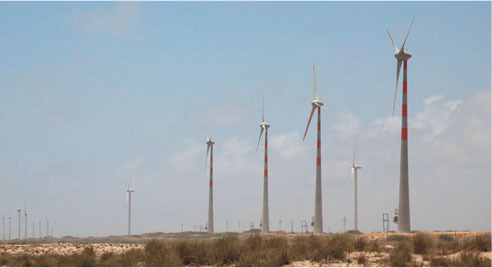 WWFCPL has been successful in assisting Foreign Direct Investment in this sector, by advising foreign companies to set up wind energy projects in India through equity infusion from abroad; with the balance being arranged as Rupee debt at accepted levels of tenor and interest cost, on a project recourse basis. Finance for projects with long term Power Purchase Agreements (PPAs), are done with third parties supplying power to them under the Open Access Regime. One such Wind World (India) Ltd. project has a long term power purchase agreements signed with private parties, wherein Wind World (India) Ltd. has established the power projects and are supplying power to private parties, with a high credit rating. We have successfully managed to arrange finance against security of the receivables due from the sale of power, to the private parties. This is done for customers who require funds and are investing in wind based power projects to avail tax benefits and sometimes save on power cost. All states where wind energy projects are being installed and have wind power policies in place are eligible for financial assistance. Projects set up for power sold to the state DISCOM for captive consumption and power g sold through the Open Access routes, are eligible for financial assistance; subject to detailed due diligence of the project specifics. Generally the debt: equity ratio of customer should be 70: 30 or less. This is subject to the due diligence process. The customer should not have defaulted to any bank/financial institution.